Support Marshall University through the scholarship fund. 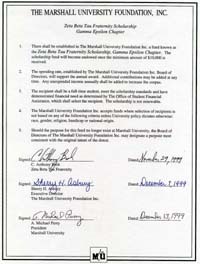 Provide financial support to students of Marshall University with financial need. Create a lasting endowment that will stand as a testament to the contributions that the Gamma Epsilon Chapter of the Zeta Beta Tau Fraternity made to Marshall University. Celebrate our shared commitment, friendship and unity. Click Here to read the Statement of Purpose and Objective. The Marshall University Foundation has created a website that makes giving convenient for those of you who would like to remember any of our departed brothers with a contribution to the ZBT-Gamma Epsilon Scholarship Fund in lieu of flowers or family gift. I would like my gift to benefit: and select "Other-use comments to specify"
I would like to make this gift and click on the radio button and enter the person's name in the box. 3. (Required) Then scroll down to the comment box that looks like this: If you have any questions or comments please enter them here: and then enter "ZBT-GE Scholarship Fund"and any other information that you want the Foundation to know. Be sure to complete all of the personal information about yourself. Don't forget to click "Continue" at the bottom of the page. You can also call (866) 308-1346 and mention the ZBT Scholarship Fund. As always thank you for your support of this project. 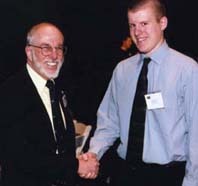 C. Anthony Broh, member of the Marshall University Alumni Association Board of Directors, and Adam Ehlert, 2003-04 Scholarship Recipient, at the 2004 MU Foundation Awards Luncheon.